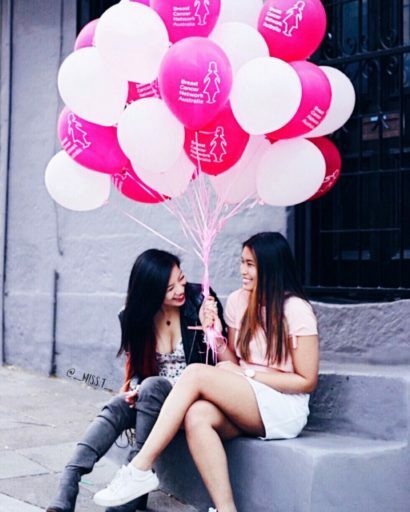 Get Your Pink On with FCBA x Eatventures! ? 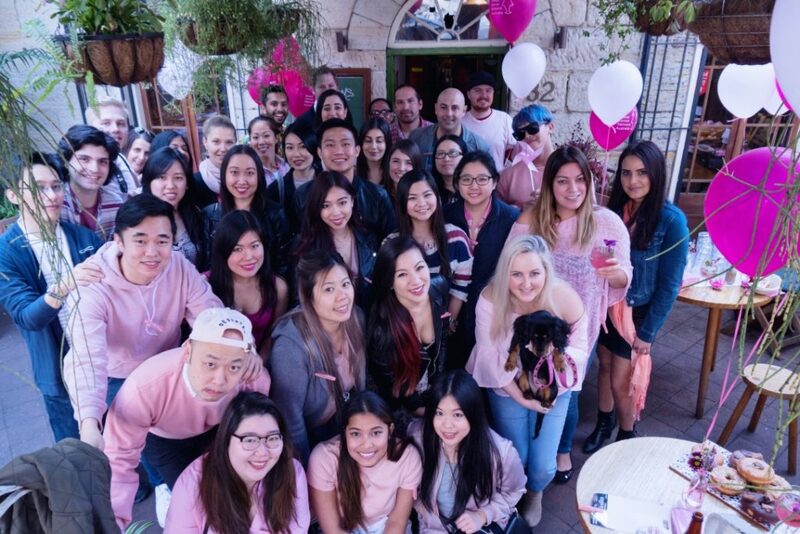 This time last month, we hosted our first Pink Afternoon Tea for over 30 of our members, to raise awareness and funding for Breast Cancer Network Australia (BCNA), an organisation close to our hearts. I was lucky enough to collaborate with Jay from Eatventures on this event, and what began as a small idea to gather our foodie friends for a small picnic and photoshoot, became a full blown out pinkiest pink event! To give a bit of background, a year ago, Jay and I, along with a few members of FCBA, attended a talk by Typsy Hospitality, learning tips and tricks from successful people in the industry. 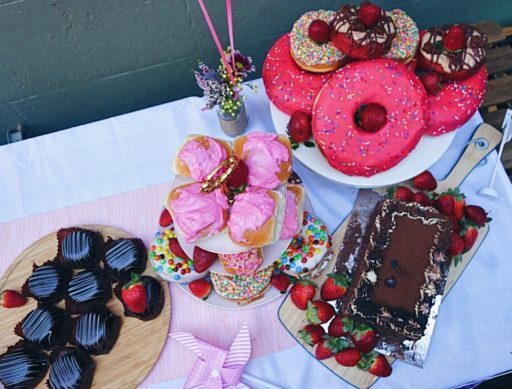 With Jay’s luck and her speedy instagramming skills, she won the $250 voucher prize to use at Doughnut Time! It was after this event that Jay and I started brainstorming all the things we could do with the voucher because she certainly couldn’t eat that many donuts herself! Our ideas grew bigger and bigger and eventually we decided that this was a perfect opportunity to use our influence to give back to an amazing cause in our community. We contacted BCNA and from there, our ‘Get Your Pink On’ event was born and the rest is history! Running with the attitude of go hard or go home, we reached out to venues and businesses we’ve worked with before to see if they would like to sponsor our event and if they would like to participate in BCNA’s #DinePink Campaign during this month. We had venues offering us a location to host our event and businesses offering us goodies to share. Each of our sponsors have been amazing in supporting and providing us with amazing pink dishes/desserts/drinks to celebrate. The Commons ( http://www.thecommons.com.au ) was a gorgeous venue who not only offered their courtyard for us to host our event but also created an amazing Beetroot Risotto and Pink Mocktail! They’ve also joined BCNA on their #DinePink campaign so please go support them! A special thank you to Brendon (@brendonthesmilingchef) for creating an incredible Strawberry Cake as the centre piece for our table! Having gone out with you the night before the event, we knew it wouldn’t have been easy to stay up late and wake up early to make this cake and it was absolutely beautiful! 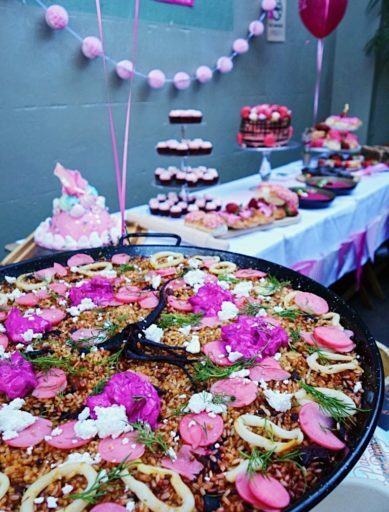 When we first spoke with Paella Del Mar (http://www.paelladelmar.com.au) we gave them a challenge; to create the pinkest Paella they could imagine! They certainly didn’t disappoint with this Squid and Chorizo Paella topped with Beetroot Tzaziki and pickled radish. They not only looked impressive but tasted delicious! 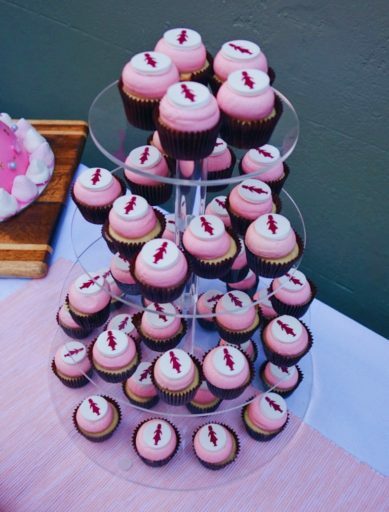 Black Velvet Sydney (https://bvsydney.com.au) provided the cutest pink cupcakes with customised BCNA logos to top them off, and these were such a hit with our members. 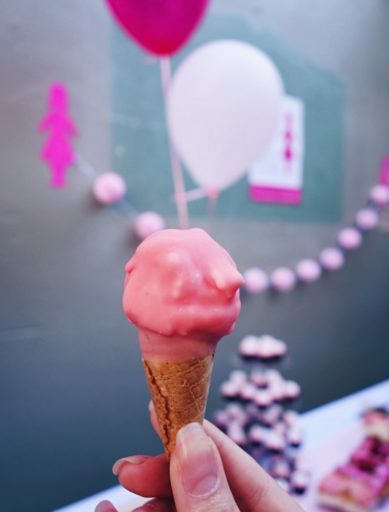 Bravo Gelato (http://www.bravogelato.com.au) created a special batch of pink themed bambino cones for us especially for this event. Super cute and delicious, they’re always perfect to bring out for a party. 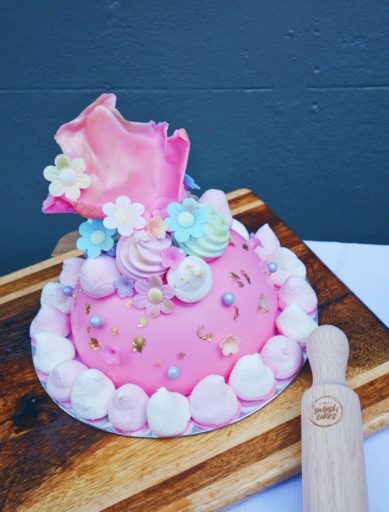 Sydney Smash Cakes (https://www.sydneysmashcakes.com.au) created a ‘Pretty in Pink’ smash cake which Jay and I had so much fun smashing into! 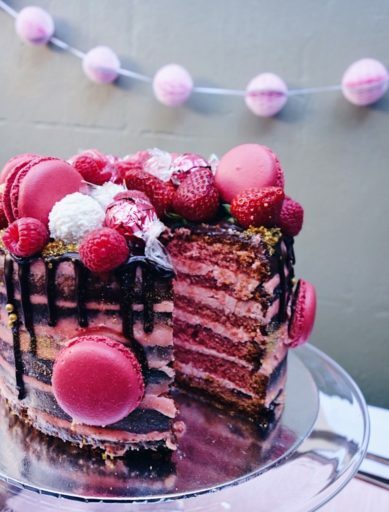 You can buy this gorgeous smash cake from their website, great for parties but also perfect if you were thinking of hosting a pink event yourself! Bakers Delight (https://www.bakersdelight.com.au) are already huge supporters of BCNA and had already ran a campaign for BCNA during May. Having them help BCNA further by sponsoring us with pink berry scrolls, finger buns and pink teatime pull aparts was just amazing. Mr Wang’s Cafe and their delicious box of goodies including tiramisu, muffins and cakes! A HUGE thank you to Jay for your amazing support, and letting us use your voucher for such an good cause. It’s been a whole year in the making but we actually pulled it off! You’ve been amazingly patient with me even when I’ve started throwing out ideas left, right and centre and I couldn’t imagine doing this with anyone else (thank you for not murdering me)! Thank you to our foodie community for helping us spread the word of what BCNA does and their #DinePink campaign this month! Raising $400 for the organisation was just the cherry on top! It’s not too late to be a part of the campaign too if you are reading this and are a owner of a cafe/restaurant/bar, you can still sign up to join via http://dinepink.gofundraise.com.au. For those who would like to donate to this organisation, you can also do so via the link or visit a participating restaurant, you have a chance of winning $1000 voucher to use at your favourite Dine Pink Restaurant too! Let’s get together, enjoy some amazing food and paint the town Pink! Newer Post FCBA x OzHarvest = Running for a cause! ?‍♀️ ? Older Post Bravos to Bravo Gelato!